I think every room needs a bit of bling and mirrored furniture definitely brings it. One of our favorite ways to add shimmer and reflect light is by hanging mirrors. But why stop at the walls when there are so many great pieces of mirrored furniture available to glam up any space. There are choices galore — from a glam mirrored cabinet to a more subtle mirrored bench. Combine mirrored furniture with actual mirrors for an absolutely mesmerizing effect. Here’s a list of ideas on how to incorporate this style into your own home. 1 – Antiqued mirrored tops of gold leaf coffee tables will add character. Look for designs with clear glass bottom shelves that offer extra storage space for your favorite knick-knacks. 2 – Use a heavily antiqued mirrored room divider to reflect light within a space. 3 – Glam up a master closet or a foyer with a mirrored bench with tufted upholstery. 4 – Real crystal knobs on mirrored dressers add a perfect touch of glamour to a bedroom. 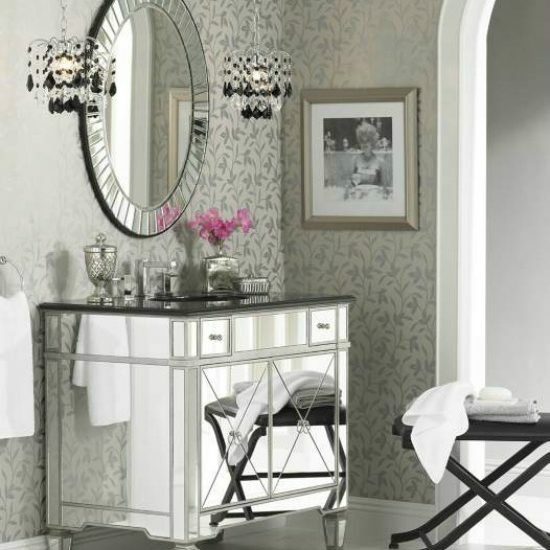 5 – Getting ready for a night on the town will be even more fun in front of a luxurious mirrored bathroom sink vanity. Look for contrasting tops of black granite. 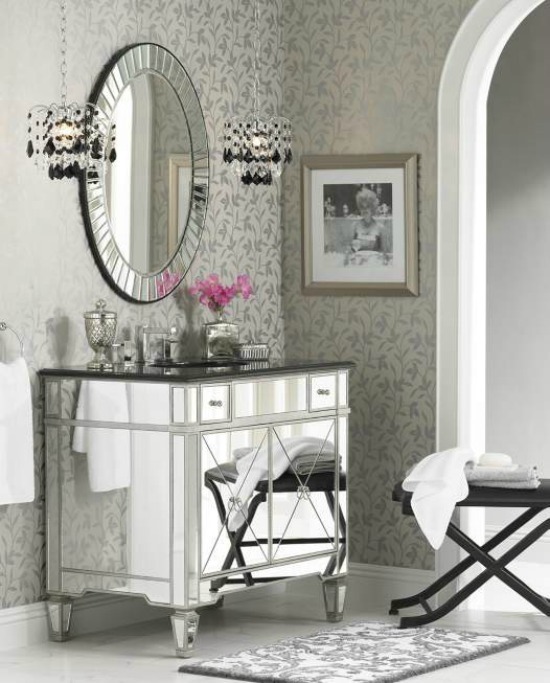 6 – The perfect mix of old world style and updated glamour combine in antiqued wall mirrors and mirrored chests. 7 – Add style and storage to your bedside, not to mention a little faux croc leather with a nightstand. 8 – Light and curvy legs add whimsy and a mirrored top adds sparkle to little accent tables.